The day of days has come and passed. We are now officially living in our own unit in Redcliffe. And not only that, we have also multiplied as our friend Albin arrived at Brisbane airport Saturday the first of February. This has changed things in several ways, especially I’d say it’s the fact that there are now two of us here who prefer not to spend our days doing yoga, lifting weights and eating alot. It has also given me a different perspective on how we, the original three act around eachother and which of our traits that are maybe not that big of a problem. Upon moving into the unit, we realised that despite it being ”furnished”, there was a complete lack of all things kitchen. 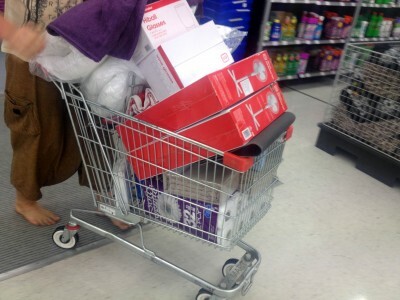 This meant a trip to K-mart where we were more or less forced to spend a total of 250 AUD on fans, glasses, plates, cups, cuttlery, pots and pans, toilet paper, towels, sheets and so on. It was an unforseen expence but we have learned from it that furnished does not mean that everything is included. The deal with the fans is this: air conditioning is expensive – fans are cheap (12 AUD each for a pedestal fan). Another thing worth noting is that one of the conditions for us getting to rent the unit was that we pay six weeks rent up front as opposed to the two weeks that are custom. This, however does not mean that we don’t have to pay rent for the first six weeks, but rather that we have created a buffert for the future. A fact that made my semi-relaxed mindset towards getting a job alot less relaxed. From a landlord point of view, this is just perfect but for us, it is a bit less so. I’ll have more entertaining news for you shortly. Peace out!